We already collected many essential information on Sherlock Holmes in the articles dealing with Conan Doyle and Joseph Bell. But the topic itself deserves much more, so in this writing we keep on dissecting the literary references. As a young ophthalmologist, Conan Doyle begun to write the stories of Holmes to work out the free time between the patients. It is an established fact that he worked „backwards” – namely he made up the crime and then unfolded the story back to the beginning. In his books he willingly depicted legends that stirred up his imagination and people whom he found interesting. Many writers impressed him, for example Edgar Allan Poe. It is evident, though, that he invented many things and amazingly mixed others. His famous creature rightly made him rich and famous. His number one Holmes story was entitled A Study in Scarlet, and it proved not so successful at first. He tried to find a publisher for it many times, and in the end the eccentric detective appeared in the Beeton’s Christmas Annual in 1887. You can see the cover of the magazine on the above picture. There are two copies dedicated by Doyle. The author proudly wrote the following: „This is my first book that ever been published.” He carefully registered the royalties he earned with the detective stories – these notes, together with his extended correspondence are held in British libraries. The model of Holmes was Professor Joseph Bell. 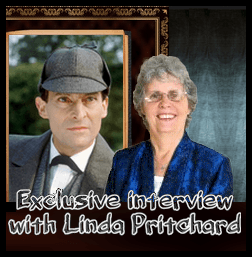 The smart sleuth met with success at his first appearance, so his adventures relocated to The Strand Magazine – this way the exciting stories got accessible and affordable for much more readers. Sherlock soon became a pioneer in solving crimes, and his name was the synonym of logical thinking. What is more important: he gave a significant thing - hope. In the Victorian England, at the age of industrial develpoment many people lived in poverty and insecurity. The heroic Holmes, who solved the most complicated mysteries, encouraged and supported them. Holmes often investigates crimes committed by people of high standing. For the members of the middle class and especially for the poor this showed that even noblemen can be immoral and violent. They appreciated that Sherlock’s judgement had not been influenced by social status – intrinsic values were much more important for him. In the story A Scandal in Bohemia he respects Irene Adler, the not so top-notched, but clever and trustworthy adventuress, while looks down on his client, the future king of Bohemia, who promised marriage to Irene and then betrayed her. In the books of Doyle drunkenness is a recurring motif. He experienced the horrors of alcoholism as a child – his father was a heavy drinker, just like one of their tenants. At that time unfortunately many people took refuge in drinking from the problems of everyday life. For those who were directly or indirectly affected by alcoholism, the adventures of Holmes were clear – they knew exactly what Doyle was talking about. The fact that Doyle, the extremely talented writer created credible, complex characters and that his stories were amazingly exciting, contributed to the success of the great detective. Thanks to these, people soon became attached to the figure of Holmes – they thought he really existed. So Holmes turned into a national symbol in Great Britain. Much to the delight of the readers, the cases of the master of deduction appeared in fiction columns in The Strand Magazine. They were illustrated by the wonderful graphic artist, Sidney Paget, who became a legend because of his Holmes artworks. Originally the editors wanted to hire the well-known Walter Paget for doing the illustrations. He already drew pictures for stories like Treasure Island and Robinson Crusoe. But the letter, addressed to „Mr. Paget” was opened by Walter’s brother, Sidney. He was pleased by the offering and ardently began to sketch. Fortunately the publisher appreciated his wonderful drawings. It is said that Sidney Paget made 537 designs to the adventures of Holmes, but not all were published, and many lost in the course of time. Walter had no reason to be upset – his brother modelled Sherlock after him. Soon passers-by stopped him on the street, because they wanted to greet Sherlock Holmes. (Though Sidney denied that he drew his brother when creating Holmes, there is a certain similarity between Walter and Sherlock – fans like to keep this romantic legend alive.). 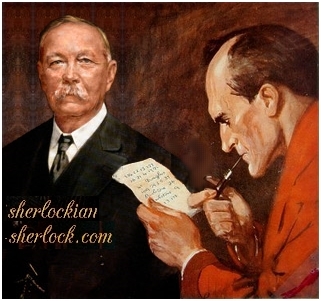 It is a fact that after Sidney’s death Walter made Holmes illustrations as well. Sidney tried to sketch in some detailed certain subjects. Based on these The Strand Magazine published a special issue in 1950 with the graphics of the flat under 221B Baker Street (though it slightly differs from Doyle’s description). Fans of the great detective love the black-and white illustrations of Paget. But there was somebody who objected to the pictures: the creator of Holmes. Conan thought Sidney’s drawings were too good: they showed a much nicer gentleman than the one he had imagined. Eventually he resigned – thanks to the pressing of his publisher. The famous literateur had to bow to other things as well: the figure of Holmes weighed on his mind. He never forgot how much he owes to the character, but for some time past he found the writing of Sherlock’s adventures very boring. He had to constrain himself to use his Parker Big Red Duofold pen in the pay of the sleuth. In one of his letters to his mother he wrote that he is inspired to create other literary works as well. The figure of Holmes tired him. Despite his mother’s objection he tossed his creature to death at the Reichenbach Falls. He hoped that the marvellous, but frightening spot which he visited on his journey to Switzerland would be worthy to bid farewell to the genius, who morally defeated the nefarious Moriarty there. The death of Holmes caused vast public outcry. Strand readers en masse cancelled their subscriptions. Many people wore mourning-bangs, and bands played dead-marches. Doyle and the editors received lots of threatening letters. The magazine lost more than 20.000 subscribers, and it was close to bankruptcy. Conan felt the weight of the publisher, his mother and the public anger. He also had been offered higher wages if he resurrects his hero, the beloved symbol of England. Then he decided to write a story that is set before the final confrontation between Holmes and Moriarty. As he was interested in legends of Dartmoor, he chose a terrifying mystery – and so was born The Hound of the Baskervilles. The story made Sherlock even more popular, though Doyle’s intention was just the very opposite. People began to talk about that the body of Holmes never turned up from the Reichenbach Falls. At last the author brilliantly brought back his most famous character in the adventure of The Empty House. Afterwards he wrote more Sherlock stories for reasonable wages, then in the story entitled His Last Bow he sent the retired detective to the lovely Sussex landscape for keeping and observing bees. This way Holmes and his creator, Conan Doyle became immortal.